​ of all children being born free of any prenatal alcohol exposure. Drinking alcohol while pregnant can cause serious damage to the developing baby; more than cocaine, heroin and marijuana combined. Imagine a world where every woman knows the dangers of drinking during pregnancy. 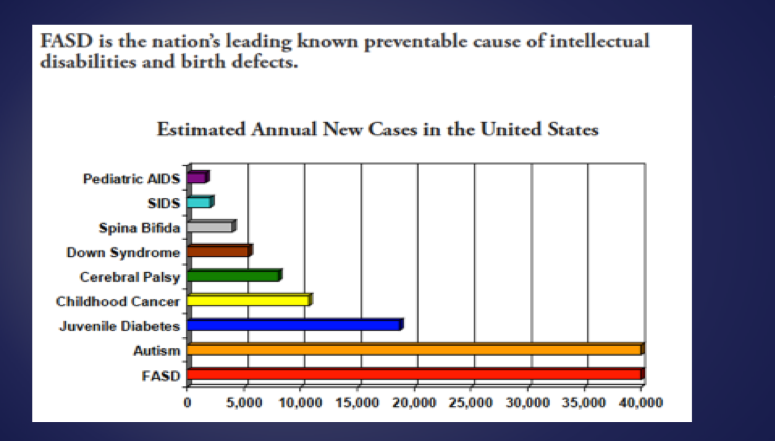 ​Together we can eliminate the #1 preventable cause of intellectual disabilities and birth defects. To reduce the number of children born in the U.S. with FASD by 80% by the year 2025. Community advocacy is critical in raising the awareness that FASD is of epidemic proportions and is 100% preventable. Women preparing for pregnancy and those at risk for unplanned pregnancy need to fully understand the critical nature of alcohol use. Shame and judgement of mothers who have children with an FASD needs to be eliminated. Children must get the support they need and researchers need to be able to work with the mothers to develop effective prevention tools. The clinical community requires more education and practical tools to use with expectant mothers to ensure their understanding and address challenging issues with alcohol and pregnancy. Schools are educating students about an increasing number of public health issues for which they are at risk. Drinking during pregnancy needs to be taught in an understandable, thorough and effective way in the context of all levels of education and belief systems. Multicenter research through the Children’s Oncology Group (COG) has proven that collaborative research improves the pace and success of curing childhood cancers. There are three strong FASD research programs focused in the US (UCSD/Rady Children’s Hospital, University of Washington, and Emory). Dr. Ken Jones of UCSD/Rady Children’s Hospital is one of two physicians who first described the Fetal Alcohol Syndrome in the U.S. in 1973. Beginning multicenter research with these centers could serve as the beginning of a COG-like approach to learning and rapidly introducing prevention, interventions, and treatments for FASD. Comprehensive Clinical and Support Services for affected children and families are critical for those impacted. Children and families need a great deal of support (see attached case for support). Currently there is no comprehensive code for the full spectrum of FASD and it is not universally taught in medical schools thus compounding it being a ‘hidden’ disability. It is incredibly difficult for children to get the necessary medical and developmental services they need. Together we can jump start immediate action on the Aim described above.